Description: BNSF 975 leads a westbound intermodal down through the Trinidad Loop on a beautiful fall afternoon. Description: An eastbound empty grain train rolls through the crossovers at Woodward. Description: High priority Lincoln, NE - Grand Forks, ND crosses Demers Ave and heads for the yard. Description: Cool to see a H1 BNSF in Bristol. Description: I often see groups of locomotives, like these, running light from Atlanta to Chattanooga to even out power distribution on the Atlanta North District. Description: BNSF H1 Dash 9 975 leads a westbound intermodal along the Des Plaines River. Description: S-SEACHC rolls out of La Crosse behind a pair of Dash-9s. Description: BNSF 975 leads the Z-PTLCHC onto single track at Winona Junction. Description: A BNSF mixed freight rolls west through Mazon. Description: East bound BNSF manifast departs the BNSF yard. Description: The orange paint on the H-1s seems to be holding up better than a few of the H-2 painted locomotives. 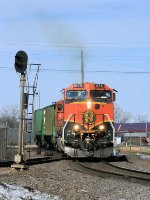 Title: BNSF 975 is dpu on this wb grain train.